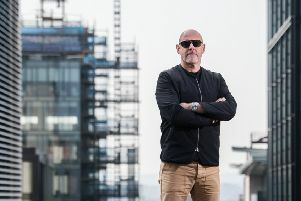 While most millionaire landowners enjoy the luxury of being helicoptered or chauffeured to their country pile, one laird of the Inner Hebrides prefers to get there on his bike. Roc Sandford regularly travels to and from his London home to spend one third of the year living off the grid on the remote isle of Gometra – west of Ulva. The 61-year-old environmental campaigner, who has not flown or owned a car for more than a decade, even got rid of his island quad bike two years ago. Choosing to make the long journey north by public transport and cycling wherever possible, he stores his bike on Mull before catching a ferry to the neighbouring isle of Ulva. The father-of-four then tackles the final eight miles of rough track to Gometra on foot, via a bridge that connects the island to Ulva at low tide. Mr Sandford, who is calling for the introduction of a carbon tax, said: “I bicycle most places if I can and otherwise use trains and buses. For more than 25 years now Mr Sandford, who with help from a neighbouring family farms a flock of 350 sheep on Gometra, has lived off-grid whenever he is on the car-free island. The island owner loves the more basic existence that Gometra offers. He said: “Gometra is a beautiful lump of rock, covered in heather, sat in the sea. “We have no mains electricity, no utility bills, no washing machine – I just have my feet and a bucket. “We have to make everything ourselves on Gometra, but that is quite fun and stimulating. It’s nicer than the on-grid version, there is a satisfaction about it.” He said he believed a greener lifestyle was as feasible for town and city dwellers as it was for his own family and the other two households who live on Gometra, where one boat a week brings the Royal Mail and supplies to the island.